Resurrection Greek Orthodox Church was established in 1971, as a second parish of the Greek Orthodox Metropolis of San Francisco in Alameda County. The parish seeks to minister to the growing population in the East Bay and Tri-Valley. Fr. Niko Bekris was assigned as our proistamenos (head priest) in November 2015, the eighth priest assigned to our parish. At Resurrection we have members who were raised Orthodox as well as many who chose to convert to Orthodoxy as adults. We represent many different ethnicities and backgrounds. Our services are held in both English and New Testament Greek. We strive to maintain an active liturgical life throughout the year and grow closer to one another through worship, common meals and fellowship, youth events, retreats, Bible study, and service. Our parish began worshipping in the Snow Building at the Oakland Zoo—the monkeys and other animals added a very interesting accompaniment to our singing! After worshipping in various other locations, the parish took possession of the current Center Street property in February 1973. The parish continues to grow and the demographics of the Bay Area continue to change. Under Fr. Niko’s leadership, the parish launched a strategic planning process in 2017 to search for new property on which to build a proper Byzantine church building in the Tri-Valley. Our plan is designed to help our community determine its next steps toward fulfilling our mission. We feel especially blessed to bear the name of Our Lord, God, and Savior Jesus Christ’s Resurrection. 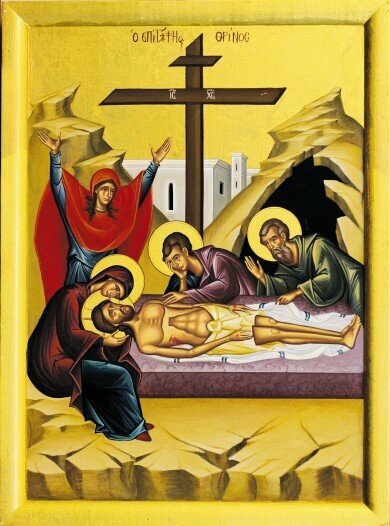 Christ’s Death and Resurrection is the central doctrine of our faith (1 Cor 15:14-17). Together, we follow Christ’s call to be “children of the resurrection.” (Luke 20:36) We celebrate our parish feast day each year on the Leave-taking of Pascha, 39 days after Pascha (Easter).